By Fr. Matthew Habiger, OSB | A moral theologian, former president of HLI and noted expert on Natural Family Planning, Fr. Habiger is a monk at St. Benedict’s Abbey in Atchison, Kansas. We are a Christian nation. We should think and act that way. These days between Columbus Day and Thanksgiving we recall the values and motivations that led Christopher Columbus to sail into the unknown horizons of the western sea, opening the way for pilgrims from all nations. As man of his times, he was impressed with the discoveries being made by Portuguese and Spanish navigators. He wanted to find a shorter route to the Spice Islands of the East Indies. Although he underestimated the circumference of the Earth by 25%, he was convinced that India and the Spice Islands were reachable by a route directly west. By so doing, he became the one history has accredited as being the first European to discover the New World. His Catholic faith was also part of his motivation. St. Christopher, the protector of travelers, and the Christ carrier, was his inspiration. He wanted to bring the Gospel to all the nations. In his first report to King Ferdinand and Queen Isabella in 1493, he wrote, “Let Christ rejoice on earth, as he rejoices in haven in the prospect of the salvation of he souls of so many nations (the natives) hitherto lost.” One of his extant autographs states that his first trip to America was inspired by the Holy Trinity. Christian crosses were left standing as markers on all the islands that he visited, and the first island he discovered he named San Salvador (Holy Savior). In 1565 the Catholic Spaniards made a settlement in St. Augustine, Florida. 42 years later, in 1607, Captain John Smith brought a group of English colonists to Jamestown, in today’s Virginia. In 1620 the Pilgrims landed at Plymouth Rock, what is now Massachusetts. The Pilgrims were motivated by their desire for religious freedom. The Quakers came to Pennsylvania, driven by the same motivation. In 1664, the Ark and the Dove — ships commissioned by Lord Baltimore, a Catholic who found favor with the English crown – arrived at St. Clement’s Island. There Father Andrew White, S.J., celebrated the first Holy Mass in the English colonies, on land granted to George Calvert (Lord Baltimore’s given name) by King Charles. The land north of the Potomac Rived was named Terrae Mariae, or “Mary’s Land,” after the wife of King Charles, Henrietta Marie. Calvert insisted that the governance of the land include religious toleration as a tenet, and it became the first English colony to adopt this social virtue. Significantly, not just John Adams, but many other Founding Fathers and early American political leaders also declared that America was guided by or founded on Christian principles. Among those making such declarations were Elias Boudinot, a President of Congress during the American Revolution; and signers of the Declaration Charles Carroll, John Hancock, Benjamin Rush, Stephen Hopkins, and Samuel Adams. 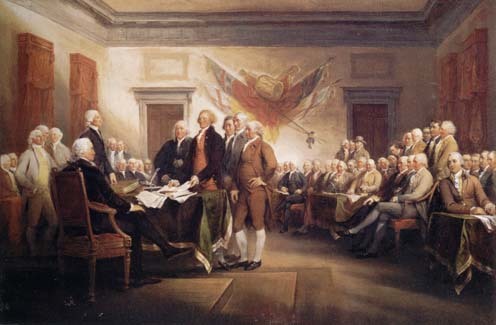 Also citing Christian principles as foundational are Constitution signers George Washington, Alexander Hamilton, Rufus King, John Dickinson, and Roger Sherman. We find in the inaugural addresses of all the Presidents, and in the Constitution of all fifty of our states, without exception, references to the Almighty God of the universe, the Author and Sustainer of our liberty. John Adams made the same argument: “We have no government armed with power capable of contending with human passions unbridled by morality and religion. Avarice, ambition, revenge, or gallantry, would break the strongest cords of our Constitution as a whale goes through a net. Our Constitution was made only for a moral and religious people. It is wholly inadequate to the government of any other” (John Adams to the officers of the first brigade of the third division of the militia of Massachusetts in the Works of John Adams). But what of the other signers, about whom most Americans know less? Of the 56 signers of the Declaration, over half were educated in schools established for the purpose of training ministers for the Gospel, and they received what today would be considered degrees from seminaries or Bible schools. Many of the Founders also served as ministers or were active in Christian service. For example, the Rev. Dr. John Witherspoon was an ordained minister of the Gospel and published several books of Gospel sermons. Charles Thomson was responsible for an American edition of the Bible, called Thomson’s Bible, still available today. Dr. Benjamin Rush, ranking in prominence along with Washington and Franklin, founded The First Day Society that grew into today’s Sunday Schools. He also helped start America’s first Bible society: The Bible Society of Philadelphia. Alexis de Tocqueville, the French commentator, in his Democracy in America, summed it up well in 1830: “Thus, while the law permits the Americans to do what they please, religion prevents them from conceiving, and forbids them to commit, what is rash or unjust. Religion in America takes no direct part in the government of society, but it must be regarded as the first of their political institutions; for if it does not impart a taste for freedom, it facilitates the use of it. … I am certain that Americans hold it to be indispensable to the maintenance of republican institutions. This opinion is not peculiar to a class of citizens or to a party, but it belongs to the whole nation and to every rank of society. … The Americans combine the notions of Christianity and of liberty so intimately in their minds that it is impossible to make them conceive the one without the other” (Tocqueville, 1840, vol. 1, p. 292 Google Books). Today we hear much about the separation of Church and State. But what does it mean? It doesn’t mean a “naked public square,” void of all Christian principles and values. Religious Freedom means that every person has the right to bring his or her deeply cherished values into their discussions, into their efforts to influence society, and into their voting. The Founding Fathers gave us a Republic, an expression of government where the people are to govern themselves by electing representatives who will implement the will of the people, and govern only with the consent of the governed. America is an experiment in ordered freedom. There is no guarantee that it will always continue. There are many forces working against it. “Our Constitution was made only for a moral and religious people. It is wholly inadequate to the government of any other” — John Adams. This means that proven citizens must know, and live by, the principles that have served this country so well in the past. These principles are derived from biblical teachings, where we find God’s basic plan for what it means to be human: for human dignity, for marriage and family, for a just society, for a just economic order and a just political order. Both Faith and Reason are appealed to here. The God of Christianity sustains his universe by intelligent design. His basic plan for the human race can be known by the use of good reason. If this is a Christian country, whose principles inspired the writers of our Founding Documents, then we are to think and act that way. If various secular forces have led the country in directions away from these principles, then the task of the proven citizen is to work to retrieve them. Jesus taught: “Render unto Caesar what is Caesar’s, and to God what is God’s.” The question is, who gets what? 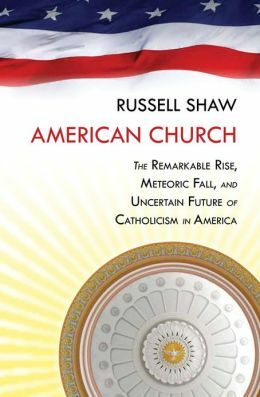 Russell Shaw explains this in his book, American Church: the Remarkable Rise, Meteoric Fall and the Uncertain Future of Catholicism in America. The problem is this. We are both Catholics and Americans. But can we be both fully Catholic and fully American? Is it possible to remain faithful to the person and teachings of Jesus, as found in the Roman Catholic Church, and still feel comfortable in our attempt to accommodate ourselves completely to the dominant American culture? We are to carry our Faith everywhere, and bring it to bear upon everything that we do. This means we are to engage the American culture with the values of the Gospel. We are not to allow ourselves to be absorbed into the dominant culture, at the risk of watering down our moral principles and deeply cherished beliefs. Our loyalties belong first to God, and only secondly to any human organization. We are Catholics because we want to honor our God. We are Americans and we want to honor our country as true citizens. The best way to be good American citizens is by being strong Catholics, by bringing our Catholic values and principles into the public square, to give guidance to the life of the community and of the nation. This is primarily the task of the Catholic laity, the 99.9% of the Church. We are Catholic Americans, not American Catholics. There are several glaring tasks for us to accomplish in a nation built on Christian principles. As a nation, we believe that all men are created equal. This means the repeal of legalized abortion. Roe V. Wade is a decision of the Supreme Court that goes against the Constitution. The first Amendment’s “free exercise of religion” protects religious freedom. Freedom of worship in the church of your choice does not exhaust this freedom. It includes the right to bring one’s values into the public square and to shape society with one’s best values. 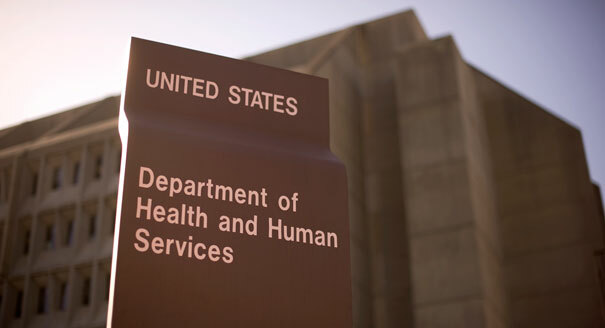 This means the cancelation of the HHS Mandate. We are to be good stewards and custodians of material goods, in this land of economic opportunity. That includes such things as drawing up a federal budget, curbing runaway spending, and not burdening future generations with huge debts. We are to take care of the “Lazaruses”, but how many people qualify for this status? We are to avoid any unnecessary dependency class, or welfare state. “Our Constitution was made only for a moral and religious people.” This means that we must return to teaching virtues in the schools as well as in the Churches. We need to demonstrate the failures of various efforts to substitute for training in virtue, e.g., values clarification, pragmatism, utilitarianism, situation ethics and moral relativism. Private schools and church based schools have strong records in promoting virtue. They should be supported.